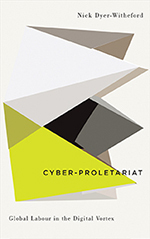 Professor Nick Dyer-Witheford has been awarded the Gertrude J. Robinson book prize for his monograph titled, Cyber-Proletariat: Global Labour in the Digital Vortex. Professor Dyer-Witheford accepted the award at the Canadian Communication Association's (CCA) Annual Meeting on May 30, which took place in Calgary. In accepting the award, Dyer-Witheford noted the important contribution made by several present and past members of the FIMS Media Studies doctoral program, who influenced his thinking on the book's topic. Information about the book can be found on the Pluto Press website. As per the CCA's website, the Gertrude J. Robinson book prize is named in honour of the many contributions of Professor Gertrude J. Robinson to the discipline of communication in Canada and around the world. It was initiated by Professor David Taras, President of the Canadian Communication Association in 1998-1999. Nominees for the Robinson Book Prize must have published a monograph in the previous calendar year, and be a member of the Canadian Communication Association.